The New York Times has produced an astonishing editorial, “Nikki Haley will be missed,” on the resignation of America’s United Nations ambassador. Given that kind of effusive language it would have been interesting to see what the Times came up with to support all the praise. Actually, the bits of her bio cited do little to support the narrative. It is claimed that she “protected some of the American investment in the United Nations against the most drastic budget cuts sought by the White House, while also working to reform the United Nations bureaucracy” for which there is no clear evidence. The editorial also claims that she maintained some independence from the president on relations with Russia, Venezuela, and other matters, though her degree of separation can certainly be questioned, as she was often the one leading the charge using threats directed against foreign governments and their policies. She has also been the seemingly dedicated advocate of nearly continuous pro-Israel positions, ranging from using the UN to disarm Hezbollah in Lebanon, to also including blocking any investigation of the Israeli army’s slaughter of unarmed Palestinian demonstrators in Gaza. In addition, she led the effort to cut funds going to the agency providing critical food and medical assistance to millions of Palestinian refugees. Haley has consistently taken a hard line against Iran, aggressively supporting Trump’s abrogation of the agreement to control its nuclear weapons, and she has ominously warned that Washington will be “taking names” of countries that don’t support its agenda in the Middle East, to include moving the U.S. embassy to Jerusalem and American military engagement in Syria. Admittedly, going after the U.S. ambassador to the United Nations is a bit of low-hanging fruit, as the position seems to attract individuals who like to vent their dissatisfaction with the world while also providing one remedy, namely that everyone should follow the American lead on all things. Former ambassadors include Madeline Albright, John Bolton, and Samantha Power, making it measurably more difficult to rank Haley as the worst ambassador of all time. But there are some firsts associated with Haley. She was the first ambassador to witness an American president being laughed at during the annual speech to the United Nations General Assembly, a response that the Times attributes solely to a decline in America’s international standing under Trump, ignoring completely the impact of Haley’s threatening language and demeanor. Dubowitz is a Canadian and it would be nice if he could be deported to a remote Internet-free spot on Baffin Island where he can cease interfering in American politics. Haley’s embrace of Israeli points of view is unrelenting and serves no American interest. If she were a recruited agent of influence for the Israeli Mossad she could not be more cooperative than she apparently is voluntarily. In February 2017, she blocked the appointment of former Palestinian Prime Minister Salam Fayyad to a diplomatic position at the United Nations because he is a Palestinian. In a congressional hearing she was asked about the decision: “Is it this administration’s position that support for Israel and support for the appointment of a well-qualified individual of Palestinian nationality to an appointment at the UN are mutually exclusive?” Haley responded yes, that the administration is “supporting Israel” by blocking every Palestinian. Haley is surrounded by neocons. Her speechwriter is Jessica Gavora, who is the wife of the leading neoconservative journalist Jonah Goldberg. A profoundly ignorant Haley apparently also has bits and pieces of her own foreign policy apart from Israel, which makes her particularly dangerous. She has declared that Russia “is not, will not be our friend” and has described the Russians as having their hands covered with the blood of Syrian children. 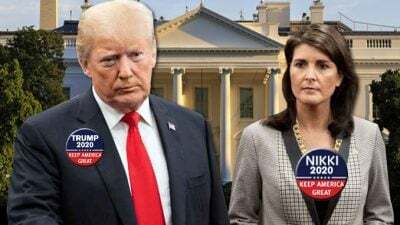 So it’s Israel all the way for Haley, and we are likely to see her again in 2020 in spite of her pledge to Trump that she would both support and not run against him. The Jewish publication Forwardrecently published a speculative article suggesting that if she were to run for president a majority of American Jews might well vote for her, turning the Jewish community from solidly Democratic Party Blue to Republican Red. It would be the first time that a majority of Jews voted for a national GOP candidate. Though a great victory for Israel, it would also be a disaster for the United States if she were elected, like a proudly ignorant Sarah Palin on steroids. That outcome does not seem to bother the editors at Forward one bit, unfortunately. This article was originally published on American Free Press. Philip Giraldi is a former CIA counter-terrorism specialist and military intelligence officer and a columnist and television commentator. He is also the executive director of the Council for the National Interest. Other articles by Giraldi can be found on the website of the Unz Review. He is a frequent contributor to Global Research. Featured image is from American Free Press.